In fact, one of the greatest challenges of being a reputable and trusted advisor is assuring prospective clients that not all advisors are the same and that there are some who are genuinely there to provide an impartial, professional service, rather than trying to sell them one particular financial product, taking their money and running. That is why MBMG Investment Advisory (MBMG IA) is licensed and regulated by the Securities and Exchange Commission Thailand (SEC). The SEC has strict regulations on providing advice on different kinds of assets and requires advisors to be qualified. However, we have lately heard tales of problems stemming from a number of unlicensed advisors operating in Asia and therefore MBMG IA’s advisors feel it’s important to point out some of the common pitfalls out there for people seeking to invest their hard-earned money. Cold-calling can be extremely annoying. It also appears to be a common strategy used by unlicensed salespeople around the world. Sending money to someone you’ve never seen, and never spoken to until a few minutes previously, could turn out badly. Nevertheless, an unsolicited offer to invest isn’t necessarily toxic or anything illegal, but it can make the receiver of the call feel pressured into buying, which is why strict rules exist. Still, when we’re talking about people’s savings and/or retirement money, a pressured buy from an unknown company, in a fund you haven’t researched, is not advisable. Last year’s failure of the Australia-based LM Investment Management was just the latest debacle that caused considerable losses for investors. LM targeted much of its sales and distribution focus almost entirely outside Australia and therefore many of its victims were based in Thailand. Many of the LM investments had become akin to so-called Mark-to-Model schemes. These are funds which are based on a predicted future value using a model, rather than an actual market. Those people who create such schemes don’t use market prices and generally prefer assets where such prices don’t exist. In such cases it’s vital to ensure the liquidity and saleability of the underlying assets otherwise a discrepancy can arise between the reported value of the investment and its real, realizable value. Over the years there have been many such schemes, which offer investors a steady rate of return irrespective of whether actual profits or losses are being made. The problem is there’s no hard evidence the assets will reach the predicted values and if enough people take out their guaranteed returns after the minimum investment period, the fund could be worth less than the money owed. 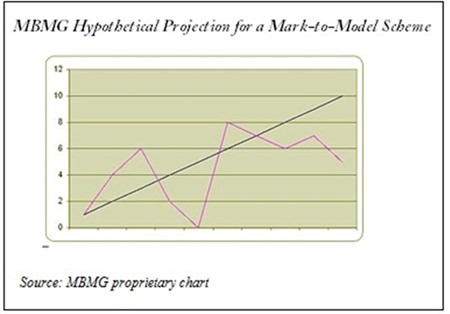 The chart shows a typical example of the problems which could occur in such a scheme: the black line represents the quoted performance, and the pink line the actual performance. LM’s funds invested most of its investors’ money into real estate development projects on Australia’s Gold Coast.3 Unlike a completed property, which has a marketable re-sale value that can be readily checked and verified, the value of partially developed projects can be difficult to verify and extremely volatile. Other examples have used litigation funding schemes, where the fund’s value increases on the assumption that lawyers will win civil cases that have been funded using money borrowed from the fund; and life insurance and traded endowment policies sold off prior to maturity. Even with physical property, care needs to be taken; the student accommodation sector, for example, is far from clear that the model calculation of a student hall of residence ties in with the market value of such a specialized asset. This does not necessarily mean that investing your money is too perilous to contemplate. The best move to make is to contact a reputable regulated independent financial adviser. A list of regulated advisory firms is available on the SEC website.4 The adviser should listen to what your plans are, what you would like to do with your money and what level of risk you are willing to take. The adviser should then come back with a detailed recommendation in return for an adviser fee, explaining which investments may be suitable and why. Another important consideration is the holistic nature of the advice - does it take into account financial planning or taxation issues? Can the advisor recommend an in-house or external expert in such matters (where the expertise is offered in-house the investment advisor should highlight the potential conflict of interest and offer external choices as well)? On another topic, MBMG would like to congratulate one of our economic mentors, Professor Steve Keen on his appointment as the Head of the School of Economics, History and Politics at Kingston University in London. 3 The Sydney Morning Herald, 17 February 2014, http://www.smh.com.au/business/drake-transferred-funds-to-de-facto-as-his-lm-group-failed-20140216-32ttm .html, accessed 7 May 2014. 1. While every effort has been made to ensure that the information contained herein is correct, MBMG Investment Advisory cannot be held responsible for any errors that may occur. The views of the contributors may not necessarily reflect the house view of MBMG Investment Advisory. Views and opinions expressed herein may change with market conditions and should not be used in isolation. 2. With investment comes risks. Please study all relevant information carefully before making any investment decision. 3. An investment is not a deposit, it carries investment risk. Investors are encouraged to make an investment only when investing in such an asset corresponds with their own objectives and only after they have acknowledge all risks and have been informed that the return may be more or less than the initial sum. MBMG Investment Advisory is a Thai SEC regulated investment advisory firm in Thailand that provides sound and impartial advice to assist private, corporate and institutional clients in all aspects of their financial life. For more information, please contact us at [email protected] or call 02 665 2534-9.